BEIJING, Aug. 14 -- After more than 10 days in space, China's 19th Beidou navigation satellite is working autonomously and has set up a link with another satellite. 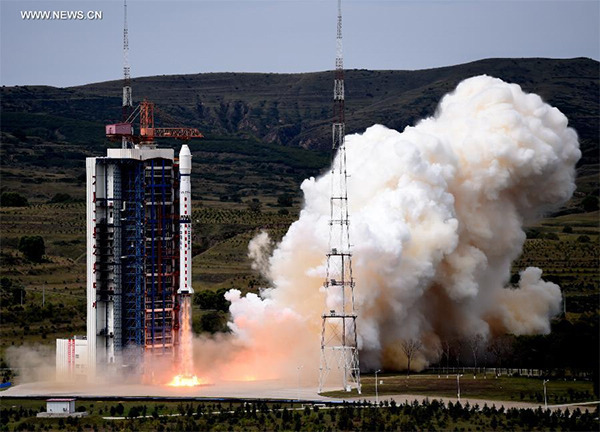 The two satellites were launched on the same day by a Long March III-B rocket from the Xichang Satellite Launch Center in Sichuan Province, southwest China, on July 25. Xie Jun, chief designer of the Beidou navigation satellite system, says China has successfully tested the autonomous control technology of the Beidou global navigation satellite constellation, an alternative to U.S.-operated GPS, marking a solid step toward building a system with global coverage. China plans to set up a complete constellation of 35 satellites, achieving global coverage by 2020. The "twin sats" surpass their predecessors in speed, accuracy and weight. "The biggest difficulty is the autonomous navigation technology," Xie said. "We need it to maintain the sustainable development of the project." Wang Ping, another chief engineer on the project, says the inter-satellite link realizes communication and distance measurement among satellites, bringing autonomous control of the navigation system a step closer. Autonomous navigation is the project's key to global operation. It enables satellites to work independently, providing users with more accurate data. Using the Chinese word for the plough, or the Big Dipper, constellation, the project was formally launched in 1994, some 20 years after the inception of GPS. The first Beidou satellite was launched in 2000. By 2012, a regional network had taken shape and was providing positioning, navigation, timing and short message services in China and other Asian countries. Beidou is one of the world's four main navigation systems, along with GPS there is Russia's GLONASS, and the European Union's Galileo. All four use autonomous navigation technology.